Just a quick update on the Marantz PMD620. 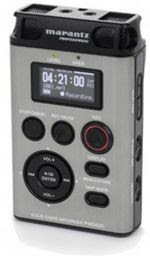 Although Marantz has yet to put out a press release or post any details about the new handheld flash recorder on its website, Josh Bancroft reports that a Marantz rep told him the recorder would cost $399 and would be available in November. While it would be nice to see more companies produce $200 and under devices like the Zoom H2, the truth of the matter is we’re not talking about iPods. The market for portable flash recorders with high quality inputs, built-in mics, and the ability to record in high resolutions is relatively small. While Apple can charge a relatively low price for iPods because it’s selling them to millions of customers, Marantz, Zoom, M-Audio, and Edirol are probably marketing their devices to thousands of customers, not millions. And thanks to the laws of supply and demand, we’re not likely to see the prices drop much lower than they already have. Still, we have to wonder how Zoom can cram a 4-capsule mic into the H2, while Marantz, Edirol, and M-Audio charge twice as much for stereo recorders. Anyway, hopefully I’ll be able to check out the PMD620 at this week’s AES show and give you a few more details.